FFA - Florida Family Association urges companies to "put America first" by dropping their advertising support for the Al Jazeera America (aka Current TV) channel. The Florida Family Association office has started contacting companies that are promoting their products on Al Jazeera America (aka Current TV) to encourage them “to put America first” by dropping their advertising. Florida Family Association urges advertisers to drop Al Jazeera America - Current TV. Have you sent your email to DirecTV? Click here to send your email to encourage DirecTV officials to put America first by dropping the Al Jazeera America (aka Current TV) channel. Florida Family Association sent out an email alert on January 14, 2013 which reported that Al Jazeera, the Arabic news television channel headquartered in the Middle East (Doha, Qatar), purchased the Current TV channel which has the potential of reaching millions of viewers in the United States. Al Jazeera America is the new, tentative name for Current TV. 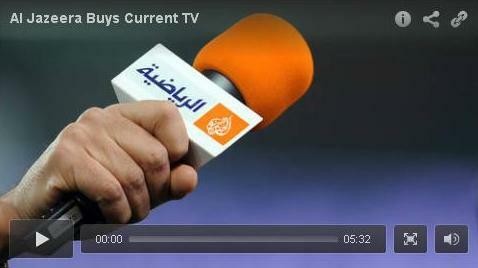 Al Jazeera is a mouthpiece for the Muslim Brotherhood and Arab Spring. The Muslim Brotherhood is the single largest promoter of the radical Islamist movement in the world. Nothing less should be expected to come from Al Jazeera’s access to cable viewers in America. The Florida Family Association office has started contacting companies that are promoting their products on Al Jazeera America (aka Current TV) to encourage them “to put America first” by dropping their advertising. The email that is being sent to the CEO and Marketing VP of each company is posted below. The names of companies and their products that continue to advertise on this network after February 1, 2013 will be posted to an article at Floridafamily.org and numerous activist web sites that are concerned about Al Jazeera's access to American television. Frequent or leading advertisers will be prominently displayed and repeatedly reported in future email alerts. The January 14, 2013 email alert identified DirecTV as the leading outlet for the Al Jazeera America (aka Current TV) channel and encouraged readers to send emails urging DirecTV to drop the channel. Time Warner has already removed the Current TV channel. The response to this email campaign has been OUTSTANDING. Many supporters of this campaign have sent their emails. In fact, many DirecTV customers modified the prepared email to mention that they would switch to another company if DirecTV continues to carry Al Jazeera America. Please click here to send your email encouraging DirecTV to drop the Al Jazeera America channel. Also, please forward this email to family and friends to encourage them to send the email on this important issue. Thank you for your support. Email that is being sent to Al Jazeera America (aka Current TV) channel advertisers. We are contacting companies that advertise on Al Jazeera America (aka Current TV) with the hope that they will put America first by withdrawing their advertising support. The names of companies and their products that continue to advertise on this network after February 1, 2013 will be posted to numerous activist web sites that are concerned about Al Jazeera's access to American television. Frequent or leading advertisers will be prominently displayed and repeatedly reported. Company name is a leading advertiser on Al Jazeera America (aka Current TV) according to our monitoring records. Product advertised on Al Jazeera America (aka Current TV on date at time on Current TV, Comcast channel 107. However, numerous other Company Name advertisements were also recorded. The Wall Street Journal reports: "More due diligence might have included a review of the close journalistic coverage over the years of Al Jazeera's Arabic and English broadcasts, which discloses the unsurprising fact that the network reflects the interests of the government that runs it-making it akin to Vladimir Putin's Russia Today and Beijing's Xinhua. The emir of Qatar, Hamid bin Khalifa Al Thani, appointed his cousin as chairman of Al Jazeera. The emir was last in the news for donating $400 million to Hamas, ..."
Al Jazeera is the mouthpiece for the Muslim Brotherhood and Arab Spring. The Muslim Brotherhood is the single largest promoter of the Islamist movement in the world. Nothing less should be expected to come from Al Jazeera's access to cable viewers in America. "The channel is tentatively being called Al Jazeera America, but a source close to the company says that it isn't wedded to the name, and may try to create a new brand." According to TVNEWSER (mediabistro.com). Current TV only has 22,000 viewers. Americans by and large are NOT interested in the content of Current TV. If any increase occurs in the number of viewers of Al Jazeera America it will be because of Al Jazeera's Islamist propaganda which does not serve America well. We urge Company Name to put America first by dropping its advertising support for this channel.